I love the phrase leaf peeper. I think It is that mix of the wonder it promises and the illicit the world implies. Such a strange combination. 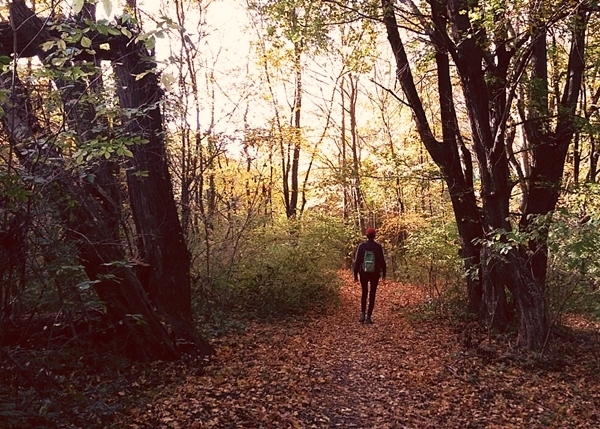 But putting the words aside, there is something magical about walking the forest in autumn. And it is not just the crisp air, or the color of the leaves. There is a strange quiet that descends over the forest. The chirping of the birds, their spring love-call is replaced by nothing but the dry rustle of the leaves when the wind runs wild among the boughs. And that smell. Oh that damp, acrid smell – which for all intents and purposes should be considered awful – is ecstatic on your senses. Maybe knowing that this is what will bring new life and feed the future is what fools us. I love to be there, experience it, smell it. No! Breathe the forest in so deep that if fills your lungs to the very brim. But it is also that time when I hate to disturb that beautiful golden carpet or that sacred quiet. My wild love will just have to tip-toe its way through the forest then.